This link will take you to a page with more information about specific warehouse management systems. 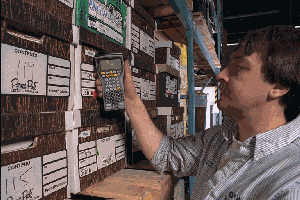 For more information, or to ask a detailed question, contact SageData directly..
WMS (Warehouse Management Systems) typically use handheld computers linked by RF to a central server. Many remote warehouses can be linked as part of one system. The link to the web element enables orders to be placed and processed quickly and accurately. The system computes the shortest pick route, and guides the picker through that route. Because the system prompts for verification, miss-picks can be reduced or eliminated. The system can receive UIC or SKU items either against a prior list, or as new items. Receiving is generally done to a receiving area, so that receipts can be processed quickly, and information immediately posted to the web element of the system. Done from the receiving area. Put away can be flexible or rigid, at the users' option. If required, can be completed easily, quickly, accurately. Audit times are typically reduced by a factor of five or ten, as compared the traditional, paper based, audit process. Apart from the saving in time (and therefore labour, and therefore money) and disruption, the automated system provides more accurate counts, and in a more timely fashion. Counts are placed directly to the database, which means that when the counting is done, the numbers are available - no data entry step. And because the system maintains a full audit trail, management can review the stock adjustment numbers, and recheck or review as required. Generally initiated from the web, supervisor controls can be incorporated. Inevitably, in any system, errors creep in, usually through human error. The system is intelligent enough to respond to unexpected pick situations (stock out, when the system shows stock available), and is able, if appropriate, to make stock adjustments on the fly. The system can produce packing lists and mailing labels. Printing of these items can be initiated from the hand held unit at the conclusion of the pick. The system maintains an audit trail of all activities, who did what and when. Traditionally, items are identified using labels with an identifier (part number or serial number, SKU or UIC) in barcoded format. There is increased interest in using RFID, small chips which communicate by Radio Frequency with a fixed or mobile reader. This an emerging technology, and despite the many stories in the press, it is not an appropriate solution for most applications. Very large supply chains, such as Walmart, are beginning to use the technology, but it still faces teething troubles. Despite this, for some very specific applications it provides an excellent solution. Contact SageData for more information if you believe that your application could benefit from RFID. This link will take you to a page with more information about specific WMS - warehouse management systems.